Based on reviews from 10 experts and 95 users. 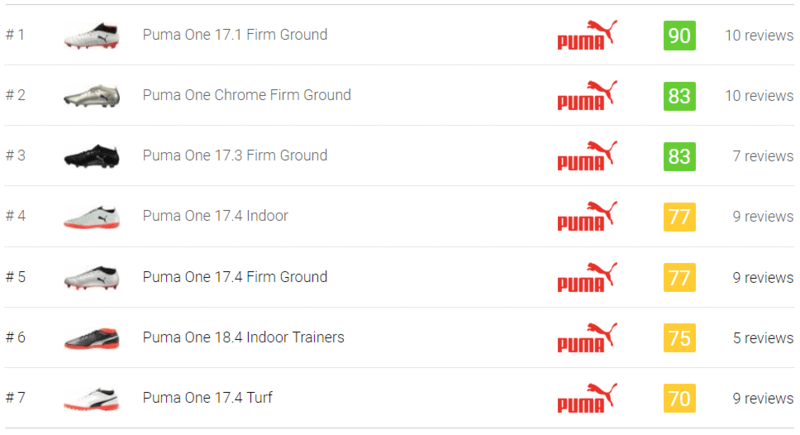 Learn how our rankings work or see our guide to Puma One football boots. Updated Apr 2019. As one of the pioneering brands for soccer cleats, Puma has been a household name for decades. Over the years the longstanding brand has released several collections which were ultimately taken over and replaced with newer (and arguably better) ones. Taking a huge leap in 2017, Puma decided to discontinue two silos to make way for the Puma One football boot. The collection’s name fit the bill with the brand’s idea of what their new release will embody. The new series aims to combine the key elements of the Puma Evotouch and Evospeed silos into ‘one’ boot. Indeed a brave step, what the brand attempts in accomplishing with its Puma One collection is to create an all-around boot; catering to the three Fs of a soccer shoe: FIT, FAST and FEEL. The Evotouch and the Evospeed silos specialize in specific areas in soccer boots. Evident in the name of both collections, they cater to ball touch and speed, respectively. Each silo features varying football technologies that are designed to reinforce a particular area of a football shoe. This is how football cleats have been developed for the longest time. Upon the arrival of the Puma One football boot, it shook the market and brought with it a refreshing take on soccer cleat construction. To understand what the Puma One football boot has to offer, it is essential to take a look at the silos that inspired the construction of the shoe. The Evotouch silo aims to come up with the best possible experience for ball touch by bringing the foot closer to the ball. It also aims to provide optimal comfort for its users. With this, it’s understandable why Puma chose a kangaroo leather upper; the ideal option to go for when looking for the best ball touch and comfort. Not stopping there, an Evoknit sock is also used for this collection. This knit-based material has been placed just below the upper, ensuring a soft feel and a snug fit while adding to a shoe’s overall structure. The Evospeed silo is for the speedy players on the pitch. The brand aptly released their lightest boot in this silo. Although, the release was not without controversy as the brand placed a disclaimer on the shoe informing customers that the pair is expected to last only ten games due to its lightweight design. With the flak that the brand got due to the durability of the original boots, they were quick to address it with the follow-up release. The second release featured a more durable upper san the disclaimer. In 2016, the brand announced their decision to discontinue the series to make way for the first release of the Puma One football boot. There are several significant features incorporated into the construction of a Puma One football boot. Combining technologies from the Evotouch and Evospeed silos, some technologies have been constant for every release. A highly praised feature of the Puma One football boot is its Evoknit sock. The knit-based material hugs the foot and creates a barefoot feel when kicking the ball. The construction is unique as the knit is contoured according to the shape of the boot instead of a rounded version of the shoe. This allows for a more structured material without losing softness; this set-up also accommodates for more stretchability. The Evoknit sock extends from the ankle area through the tongue and the lacing system creating a more natural fit. Natural leather has always been favored by most in comparison to synthetic uppers. Perhaps this is the reason why the brand incorporated them into their cleats. During the first release of the Puma One football boot, the brand opted to use calfskin for the upper while their second-generation release sported the more popular kangaroo leather. Both types of leather have something unique to offer to its users. Calfskin Leather - A calfskin leather upper is incredibly soft (given that it’s properly broken in), has a good ball touch and is water-resistant. This material is also extremely durable. Although what comes with its durability is a more substantial weight (compared to kangaroo leather) which in turn demands a more extended break in period. Kangaroo Leather - kangaroo leather is the most favored material for uppers. It is the ideal material when looking for softness (even fresh out of the box), a lightweight feel, and excellent ball touch. Durability is also a given. The catch is that it is not waterproof. An added feature Integrated into the kangaroo leather upper of the Puma One football boot is 3D striking curves. This design is intended to aid grip on the ball while yielding a better contact surface. For the soleplate, Puma seems to have played favorites by choosing Pebax. Incorporated into the Evospeed and Evopower silos, the Puma One football boot still sports a similar material. Pebax delivers durability, a lightweight feel, and a dynamic fit. It also boasts optimum movement responsiveness and flexibility. The outsole of Puma One football boot is all identical throughout its releases featuring a blend of bladed and conical studs for optimal speed and traction. In 2017, the first release of the Puma One football boot brings with it a blend of features that highlight what the EvoTouch and EvoSpeed silo has to offer. Offering a two-for-one deal, the Puma One football boot boasts a calfskin leather upper with an Evoknit sock. While the upper is thicker than premium kangaroo leather, it still brings a soft and cushioned feel. The Evoknit sock, on the other hand, emphasizes a secure fit. With its construction, it allows for flexibility and foot support. The feel of an EvoSpeed boot is highly apparent in the soleplate. Possessing features that boost speed, this shoe has a thin plate. The studs integrated into the soccer boot are a combination of conical and bladed ones for quick turns as well as acceleration. Additionally, a reversed ‘V’ stud is placed in the forefoot which adds control and enhances braking ability. There have been several versions of the Puma One football boot made available by the brand ranging from the premium Puma One 17.1 football shoe and extending to lower-tier cleats including Puma One 17.2, 17.3 and 17.4. While it might seem early, the newest release for the Puma One football boot happened in early 2018. Dropping the second-generation Puma One football boot just six months after the first models came out, there have been several updates added to the new line up. Comfort and a good fit are pretty much a given with a kangaroo leather upper integrated into the second release of Puma One football boot. Another feature incorporated into the shoe are the 3D striking curves which provide better contact surface and an additional ball grip. The brand decided to keep the Evoknit sock which creates internal support and to ensure foot lockdown. The soleplate improved when the Rapidsprint Pebax outsole was incorporated. This material helped in reducing the boot's overall weight. Additionally, the stud configuration is designed for fast turns and quick bursts which aids acceleration. It is essential to the lifespan of a football boot to match its outsole with the type of surface that it is used on. Hence, the Puma One football boot models offer different versions of the shoe according to different courts. Firm Ground (FG) boots - Using different materials in the construction of the soleplate, boots under the Puma One silo uses either Pebax (for the premium models) or TPU (for the low-end versions) for their firm ground boots. For the stud configuration, the brand made use of conical and bladed studs. Soft Ground (SG) boots - Screw-in studs are a staple for soft ground football boots. Using a TPU-based soleplate, the cleats under the Puma One collection comes with a version designed for soft ground courts. Artificial Grass (AG) boots - Still making use of Pebax or TPU depending on its price-tier, Puma One AG shoes are designed to yield as much traction as possible in AG surfaces. Indoor (IC) boots - The indoor version of the Puma One boots comes with non-marking, gum-rubber sole that ensures grip especially on polished surfaces. Has there been any limited-edition releases under the Puma One silo? Yes. So far, there have been two limited-edition boots that were released under the Puma One silo. Sporting unique looks, the limited edition release included the Puma One Chrome and the Puma One Gold. As suggested by their names, both boots featured chrome and gold colorways. The Puma One Chrome football shoe, unlike the rest of the collection, featured a full synthetic upper parallel to its look. During its launch, Puma partnered with the celebrated footballer, Antoine Griezmann. Similarly, the Puma One Gold had a distinctive look with its (obviously) gold chrome finish from the upper to the shoe’s soleplate. To enhance the colorway, a synthetic upper is also used. The player whom the brand partnered with in the shoe’s release is Sergio Aguero. What are the soccer technologies unique to Puma? Speedcell - This technology gives way to better flexibility while reducing weight as it permits a mono-layered microfiber construction. Accufoam Technology - Integrated into the upper, Accufoam provides comfort as well as power when kicking the ball during play. INSQIN Waterborne PU - Just recently unveiled with the launch of the Evopower Vigor 1 boot, this technology has been used by the brand to produce upper material using 95% less water and 50% less energy. It is technology that focuses not just on cleat design but also on sustainability. Netfit - Originally found in Puma’s running shoes, this technology has been recently fused into football boots. The idea is to create the best possible fit with the use of a high-grade engineered net that hugs the upper and shoelaces. In threading the shoelaces through the holes of the net, this permits the player to create an endless array of lacing combinations and gives the player the freedom to develop and settle on the lacing pattern that best fits his/ her needs. Adaptlite Upper - Used in the Evopower 1.3 FG, this type of upper permits enough bending motion to mimic the feel of kicking barefoot.